Lincoln Center for the Performing Arts.Org contacted me about developing a video controller interface that is both reusable, could be updated in minutes, points to various fla. Files located on server and has built in detection in case server is busy. The video controller can be exported out of flash and embedded into any of the Lincoln Center Performance Arts. Org pages. The Video Controller can used multiple times has an intro watermark, image and video content with pause, play, stop rewind, fast forward, mute and volume controls. I was contacted by Marion Black CEO of GwC foundation in developing an online CwG foundation Educational Program that uses a subscription service to stream video. 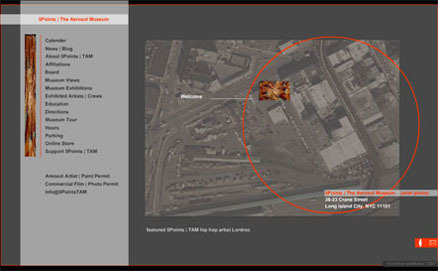 The video content was defined to display on multiplatform feed (desktop, ipod and cell phone). The IA design and membership includes educational programs, interactive video courses, bogging, social networks, therapeutic groups, audio and video pod casts and real time video streams. I also produced a seasonal 2007 Xmass + New Year's Card for Marion Black. 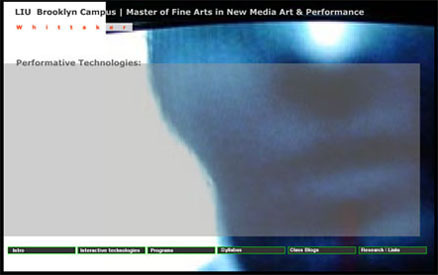 Perforative Technologies was a demo syllabi that I developed in application for a position with with the LIU Brooklyn Campus Perforative technologies is an interactive performance-based merging performance and technology. The technology could either be physically interactive or visually interactive or extend itself to an interactive prop (outside of the body). Jonathan Meres Cohen CEO of 5Pointz talked to me about developing a comprehensive website demo 5Points | TAM defining this amazing building dedicated to the "living arts" and its surrounding community (that the NY Times declared "the museum with only walls"). By 2007 Graffiti and rap has evolved over 4 decade’s in the 5 boroughs of NYC to then recognized worldwide Aerosol Art and Hip Hop. Kurt Ostergaard of Manhattan Hypnosis contacted about redeveloping his website site with an emphasis on hypnosis to treat smoking addiction. 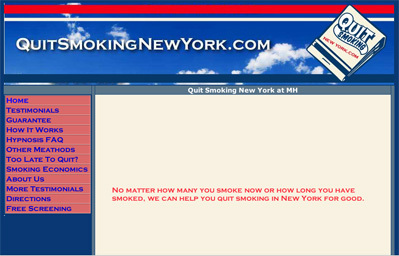 Domain name quitsmokingnewyork.com was chosen as the domain name based on the most common client search. A matchbook was also redesigned as a promotional marketing tool for the website. Melanie Rodriguez presented me with a unique problem given she has been working in the scope of public murals and wanted to move more into public projects. I came up with a site that could help generate revenue for future public projects by marketing various byproducts. Inspired the 12 years that Melanie's spent teaching in the South Bronx working with adult youth she felt inspired to bringing public focus and positive change into the urban community. Melanie Rodriguez studied dance in her formative years as well painting and making art in various formats. 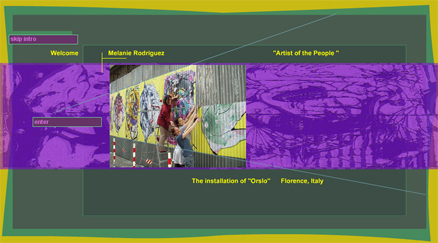 The Melanie Rodriguez V2 interface was an attempt to combine the lyrical movement found in most all of her artworks as well to introduce (4) public art projects (1) public art work that has been fully developed and (3) partially completed public art-projects that would require further funding to bring into fruition. As a strategy I introduced to her the idea of developing "byproducts" for all (4) public art projects to help bring the later (3) into fruition. Basically taking an "entrepreneurial approach" to funding public art works rather than grant or government funding. The "byproducts" were developed to be mass produced, affordable to the buyer and as well are used to push Melanie Rodriguez and her concepts as a socially conscious brand. Anegelica Bergamini had a unique problem she looking for a way to market fine art aside wearable art. For the most part the work has strong “sculptural elements” thus I decided to develop a marketing strategy based on that and a split interface where both “Sculpture” and “Body Sculpture” would b equally represented. It was a very simple interface that was easy to navigate.